Experience the fantastic benefits of the Ergobaby 360 Carrier and carry your baby while shopping, walking or pottering around the house. With the Ergobaby Four Position 360 Baby Carrier, you now have four comfortably safe, ergonomic positions to nurture your babies developmental growth with your loving support and attention, giving you and your child freedom of movement as well as a unique closeness. Your child's weight is distributed on the hips as well as the shoulders of the wearer. You can carry your child comfortably for hours without any back pain. It's true. The uber-comfortable Ergobaby Carrier has made life easier and more active for millions of families across the globe. The Ergobaby 360 Carrier is designed for optimal hip placement for babies and all-day comfort for you. Padded shoulders and waistband create equal distribution across your body, while your baby sits or sleeps comfortably next to the familiarity of a family member. For parents who want the safest, most comfortable baby-wearing option, Ergobaby have long been a reassuring name for your baby's second "womb." 1. STRUCTURED BUCKET SEAT - Keeps baby ergonomically seated in all 4 positions, with knees even to or above hips, with baby's spine in curved "C" position. Button adjustments let parents adapt the seat width to the baby's size & position. 2. 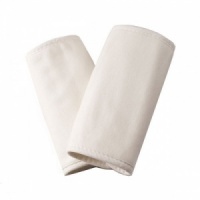 EXTRA WIDE VELCRO WAISTBAND - Exceptionally comfortable waistband can be worn high or low on the waist depending on preference and provides extra support for the low back. 3. EXTENDABLE BACK PANEL - Can be rolled down for front-outward, or upwards for the inward facing positions to provide extra head, neck and back support for baby. 4. PADDED SHOULDER STRAPS - Helps evenly distribute baby's weight in combination with the wide waistband to maximize parent comfort. 5. SLEEPING HOOD - Provides support for baby's head while sleeping, protection from sun and added privacy while nursing. A parent favorite features. Curious babies sometimes prefer a front seat view of the world (facing out) for very short periods of time (to avoid overstimulation and discomfort). You know your baby best. No, Ergobaby's Four Position 360 Carrier is not a "crotch dangler." In our carrier, regardless of the carry position, baby is seated in the ergonomically correct, frog-leg position with knees at or above the hips. For us, it is important that parents carry their children, as being carried satisfies a fundamental childhood need for closeness, physical contact and a sense of safety. Stand on any street corner and just watch — you will see children demanding to be carried and parents picking them up and carrying them, often for hours, which is highly exhausting for the parents. We designed the ergonomic, Four Position 360 Carrier to offer parents many options in one carrier – front inward, hip, back AND front-outward facing ("facing out"), in order to meet parents' request for this option for babies who are physically and developmentally ready for greater interaction with their environments. Important note: we recommend that this position be used only for short periods starting from the age of 5-6 months upwards, and only when the child is awake. If the child is tired and wants to sleep, we recommend parents change the position to an inward facing or back carry position as the preferred and most comfortable solution. In the past you have championed the idea that children are subject to a great deal of distractions/overstimulation when carried "facing out". How can you reconcile this with your previous philosophy? Are you not sending mixed messages to parents? We view the front-outward position ('facing out') as a supplemental option for short, active periods and not as the primary carrying method over multiple hours. Now and again, situations arise where parents — and children — prefer this position. Naturally, there is a greater risk of overstimulation than with the 'facing in' position, since the child cannot actively turn away. Yet on the other hand, the ergonomic posture ensures very close body contact that allows parents to actively perceive the signals their children are giving. Parents know their children best and can tell when their child is fussy, tired or "zoned out" and it is time to switch to the 'facing in' or back carrying position. As a manufacturer of comfortable, ergonomic carriers, we want to offer parents a choice of all options for ergonomic carrying. Our goal is to encourage and embrace all parents to wear their babies for as long as possible by giving them a comfortable, healthy way to do so. Additionally, by giving parents who insist that their carrier have a front-outward option a choice within our product line, it allows us to communicate with them about overstimulation in all of the activities and products that they choose for their baby. We are hoping that this will make new parents more educated about all of the situations that can lead to overstimulation and make them more attuned to baby's cues that she is overstimulated. Yes, the Ergobaby 360 Carrier ensures that babies are seated in the ergonomically correct, frog-leg position with knees even to hips, and a rounded spine. This is true for all 4 carry positions. The bucket seat ensures baby's back will be curved – not arched, allowing baby to always be seated in an ergonomic position with all four carry positions. The seat also allows the baby's bottom to be fully supported and prevents pressure on baby's crotch area. Although we have designed the carrier to distribute baby's weight as well as possible, parents will always find that inward leaning (front inward, hip, back) will be most comfortable for parents. If parents become uncomfortable with their baby in the front-outward position, they can quickly and easily and quickly transition their baby to one of the other 3 carry positions. Each parent and child is different, but usually around 6 months, baby will be ready to be carried on the back and parents are more comfortable with not having their baby in direct line of sight. People with larger babies who are more developed may choose to put their baby in the back carry position even earlier than 6 months, especially for longer carry times since many parents find it more comfortable to wear heavy babies on their backs. What do midwives and baby wearing consultants have to say about Ergobaby's new Four Position 360 Carrier? The expert feedback we received during the product development process was and remains highly positive. The midwives and baby wearing consultants that we met with during the product development process were skeptical at first before seeing our Four Position 360 Carrier. Yet, after seeing how ergonomically positioned the babies were in all 4 of the carrier's positions, the midwives and baby wearing consultants appreciated having a truly ergonomic 4 position carrier to recommend to parents. Many baby wearing consultants heard, as did we, that a number of parents were actively looking for an ergonomic, outward-facing position carrier. The midwives and baby wearing consultants that we met with felt comfortable recommending the front outward position for babies 6 months and older as an option for these parents with the further recommendation that this position be used for short periods of time. It is our hope that the Four Position 360 Carrier may inspire more parents to try and embrace baby wearing without losing sight of the ergonomic aspect for their babies and themselves. The product testing that we conducted with dozens of parents reinforced their hope and desire to have a single Ergobaby carrier that could deliver multiple carrying positions that included front inward, hip, back and front outward. There is a belief that only the 'facing in' position puts children in the anatomically correct spread-legged sitting position. How did you resolve this problem? As one of the leading manufacturers of baby carriers, we of course knew that any solution we created had to offer full ergonomic benefits in all positions. We designed the Four Position 360 Carrier so that it has a structured bucket seat, ensuring that the correct spread squat-leg sitting position is maintained even in the Front-Outward position. At the same time, the child's pelvis is gently tipped toward the rear when placed into the carrier, so that the child's upper spine makes contact with the parent's body along its full surface, which supports the physiology of a baby's slightly rounded back. For children who cannot yet support their heads, this support is very important. 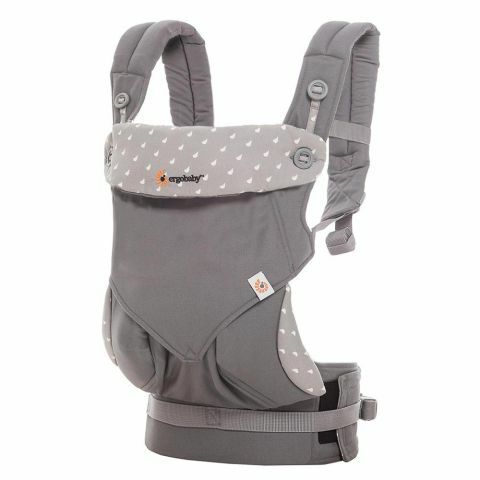 Our unique ergonomic infant insert and the head supports on all of our carriers ensure this support at all stages of development. The 'front outward' position should only be used once the baby has strong and consistent head and neck control and has outgrown the Infant Insert, meaning the child fits into the Four Position 360 Carrier without the insert and is already able to support her head. We thus recommend that the 'facing out' position be used when baby has demonstrated she is ready, only for short periods starting at 6 months, and only when the child is awake. If the child is tired and wants to sleep, the 'facing in' position on the parent's chest or on the back is still the best and most comfortable solution. Parents form tight bonds with their children. Parents know their children and their children's moods and as a result, are in the best position to decide the optimal way to wear their children based on various factors, such as the situation, the child's mood and the estimated carrying time. Our Four Position 360 Carrier gives parents the option of making this decision based on their own individual needs as well as those of their child. The easy-to-use carrier allows for quickly changing between the different positions when circumstances and situations change. Is the new Four Position 360 Carrier safe? Our new Four Position 360 Carrier meets high safety standards. The safety of our children's products is our utmost priority. The new Four Position 360 Carrier, as with all our carriers, has added safety mechanisms on the hip and shoulder belts, including high-quality clasps, carefully selected materials and a sturdy overall design. It was developed in collaboration with midwives and baby carrier consultants and extensively tested with parents of babies ranging in age from newborn to 4 years of age. Can I breastfeed with the new Four Position 360 Carrier? How does that work? As with all our other carriers, the Four Position 360 Carrier can be used with our unique, custom configurable Infant Insert (sold separately) that allows all of our Ergobaby carriers to be used from birth for babies weighing 7 lbs/3.2 kgs and above. Our Ergobaby Infant Insert works with the Four Position 360 Carrier the same way that it does with our other Ergobaby carriers, so parents and baby wearing consultants will have no trouble using the Ergobaby Infant Insert with our Four Position 360 Carrier if they are familiar our other Ergobaby Carriers. Again, we want to reinforce that the Four Position 360 Carrier only be used to carry children in the 'facing out' position once they are 5-6 months old or older, and even then only for short periods. Prior to that, the "facing in" position on the parent's chest is the preferred and most comfortable solution. Carrying isn't a mandate, but rather the most simple, healthy and easy way to transport a child while promoting a strong bond between the parent and the child. Therefore: Parents and children should together determine which position and duration is preferred and most comfortable. Follow your baby's lead and respond to her cues. As with all Ergobaby baby carriers, the Four Position 360 Carrier can be used from birth (with the Ergobaby Infant Insert, sold separately) for babies weighing at least 7lbs/3.2kgs up to approximately 4 years old (up to 33lbs/14.9kgs), and allows for carrying your child in 4 ergonomic positions – front-inward, front-outward, hip, or back. The child's weight is evenly distributed between the shoulders and waist — ensuring long, comfortable periods of carrying. Our Infant Inserts are designed so that you can safely carry your newborn baby from day one if they are 7lbs or more, and until age 4-6 months. It is designed to provide ultimate comfort and support for baby, by providing head, neck and spine support and ensuring baby is correctly seated while in the Ergobaby Carrier. Once your baby can hold her/his head up for long periods of time and is comfortable with her/his hips in a splayed position, the use of the Infant Insert is no longer necessary. The Infant Insert is designed to grow with your baby. The top rounded edge of the back and neck panel can be folded outward and down to provide more neck support for smaller, younger infants. The removable pillow at the base of the Infant Insert provides extra height, support and cushion for baby and enables a natural seated position. For babies with strong head and neck control who could use a boost in the carrier, the pillow can be removed from the Infant Insert and placed directly in the carrier for baby to sit on. This is for small babies who have strong and consistent head and neck control (typically 4-6 age range) but are either too short to bend at the knees when seated in the Carrier or would like to be seated higher in the Carrier. Use the back support cushion without the pillow for larger or taller babies who still need head and neck support. Infant Inserts are sold separately or within the Bundle of Joy. All Ergobaby Infant Inserts can be used with any Ergobaby Carrier. NOTE: Babies grow and develop at different rates, so their transition to pillow only in carrier or without infant insert in carrier typically takes place between 4 and 6 months. Since babies grow and develop at different rates, monitor your newborn's development to decide when she/he is ready for the transition. We have used this mostly when our little one was 6+ months, on our backs, while out for long walks; we can go places that buggies cannot, and can go at a brisk pace if we want. I haven't tried any other slings so I can not compare but this sling ticks all of the boxes for me. It's so easy to use. I have been using it since my baby was 5 days old with the inserts. He's now 6 months and weighs a tonne and I still use it all of the time for long walks without feeling any strain. Ordering from earthmother is always a pleasure also. Great product. Easy to use and comfortable. Looks very good also. Looking forward to getting lots of use out of it. This is the third baby carrier we've tried with our five month old and definitely the best. It's comfy to wear and the weight is spread evenly so your back and shoulders feel good. The baby seems comfy, secure and well supported. We've only just got it, so only used it twice but both times she fell sound asleep while we were out walking and could be lifted easily into her cot. It's also great that the straps are fit to suit each user at each wear so is much handier to share with my husband, or with/without a coat.